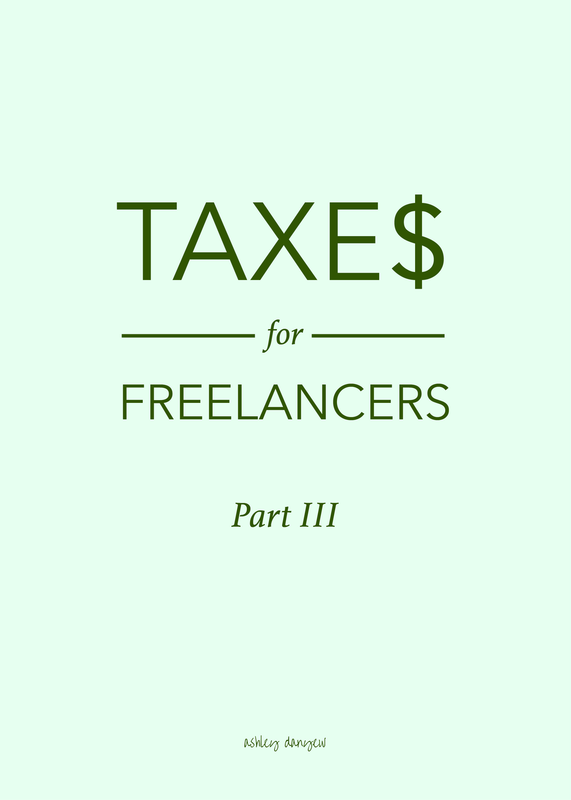 Welcome back to the third post in my "Taxes for Freelancers" mini series (be sure to read Part I and Part II, if you missed them!). Today, I want to share a bit about my process for staying organized and keeping good records throughout the year. This is essential for making sure tax season goes smoothly! One thing that helps me stay organized is setting aside a few hours each month to work through a list of business to-dos (inspired by this post). On the first Friday of each month, I spend a few hours organizing my records from the previous month, checking in on my financial goals, and preparing for the month ahead (make invoices, schedule blog posts, etc.). SD and I set financial goals at the beginning of the year with monthly investment amounts. It's rewarding to see our progress month by month! In addition, I feel more productive and organized when I do all of these more administrative tasks at one time (instead of remembering to pay bills at different times each month). As a teacher, music director, and full-time student, it helps me to step back every few weeks and evaluate my business as a whole, reflect on my teaching, and plan ahead. Setting aside part of a day each month keeps me accountable in those tasks that can easily be overlooked (e.g. filing receipts, tracking mileage, and setting aside estimated tax). Some of the things on this list help me stay on track with my monthly goals, as well (bonus!). The real secret? Organize and keep records as you go. 1. Report your income and expenses in a spreadsheet each month. 2. File your receipts every few weeks. 3. Tally your business travel receipts when you get home from your trip. 4. Keep a separate bank account for estimated tax money. 5. Keep a little notebook in your glove compartment to document mileage. Have other creative ideas for staying organized and keeping good records throughout the year? Leave a comment below - I'd love to hear! As I mentioned in my last post, SD and I are by no means tax experts, but we've learned a thing or two about filing taxes as freelancers that I thought might be worth sharing. This series does not replace talking to a professional - if you're brand new to this, I highly recommend that as your first step! - but it's my hope that these resources and suggestions can serve as a broad introduction to doing your own taxes and keeping good records throughout the year. Taxes are complicated and they can take up a lot of time, if you're doing things yourself. Want to know our secret for staying sane? We start the process in January. We work on some of the tasks below on our own and then sit down a few times over the course of February/March to go through the software together (by the way, we use H&R Block). 1. Gather year-end statements and tax documents. 2. Pull receipts and expense records and calculate totals. 3. Add up miles driven for business. Driving to and from a gig? Keep track of your mileage! Any time you drive to "work" (a place that doesn't send you a W-2), you can deduct that mileage using the federal mileage rate. It's best if you can keep something in your car that will prompt you to write down starting and ending mileage for each trip, but if that doesn't work for you, keep track of the dates and destinations and calculate the mileage later. Also, figure out the total number of miles you drove last year (they'll ask for this number, too). 4. Make a list of any charitable donations. Whether you donate a bag of clothes to Salvation Army or make an annual donation to your Alma Mater, you can report all charitable giving on your taxes. 5. If you paid estimated tax last year, look up these payment amounts (federal and state). If you make more than a few hundred dollars a year in your freelance work, it's a good idea to make estimated tax payments (federal and state) each quarter (April 15, June 15, September 15, and January 15), since no one is withholding money from your paycheck. You can do this online pretty easily. A good rule of thumb is to pay 5% of your quarterly earnings to your state and 20% to federal. When you file your taxes, they'll ask how much you paid each quarter, so have these amounts ready. If you underpaid during the year, you have to pay a fine; if you overpaid during the year, you get a refund (yay!). Hope this little glimpse into our process is helpful! More ideas, strategies, and helpful hints coming soon in Part III! 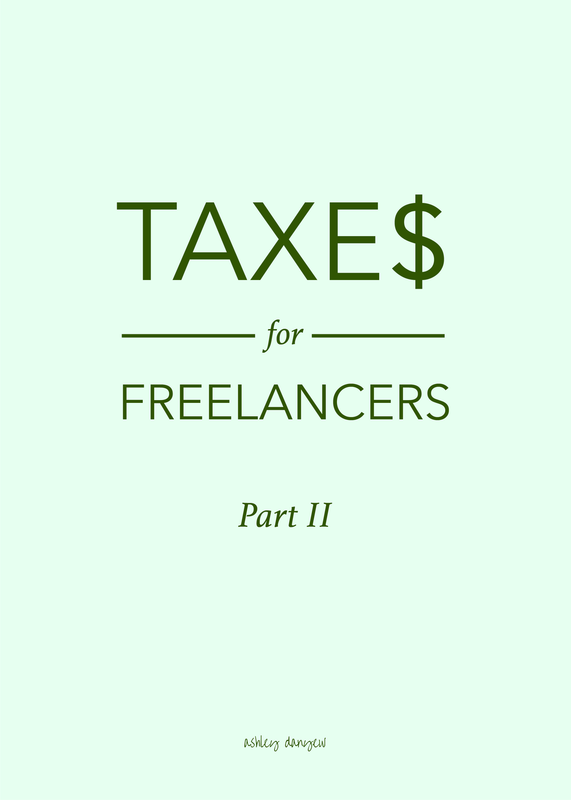 I'm excited to share this post with you today, the first in a mini series on taxes for freelancers. I know, taxes are super fun and exciting, but as a freelancer, it's part of managing your own small business. SD and I have been doing our own taxes for more than five years now, and, while we don't consider ourselves experts by any means, there are a few things we've learned along the way. I'll be sharing a little bit of our process in upcoming posts. Do you do your own taxes? What are some of the things you've learned as a freelancer? Keep track of your mileage (gigs, self-employment teaching, medical, professional development) and add it up in advance. Collect tax documents from employers, banks, investment companies, and lenders in advance (many post them online instead of mailing them log in and get the information you need before sitting down to complete your returns). If you make estimated tax payments throughout the year, make sure you have a list of the amounts and dates. Review your credit card statements in advance to be sure you didn’t miss any expenses that might be deductible. WCMW Planning. The Westminster Chamber Music Workshop is a series of free chamber music events in Westminster, MA. Each event is designed to be educational and entertaining for community members of all ages! This year, Steve and I are planning four music events, one for every Saturday night in May. Running a small organization of any kind is a lot of work but lucky for us, we love it! We have two small grants from local cultural councils to help us provide these concerts at no charge to the community and we recently announced our exciting line-up of guest artists. March is our month to get the word out, send guest artist contracts, garner sponsorships, and begin designing our print materials. Here’s to March – a month of getting organized, making decisions, and making excellent things happen! After three years of doing my own taxes, you'd think I'd have this figured out by now. My biggest problem seems to be staying organized during the year. I save receipts, I keep my pay stubs, I collect statements of various accounts, I record my mileage, and I keep track of my teaching income. It's bigger things - professional development, health receipts, donations, gig money, and business expenses (phone, internet, etc.). A combination of W-2s, 1099s, and self employment between two states doesn't help. After a full Saturday of sorting papers, crunching numbers, and cursing the software that kept "not responding" (without real curse words, of course), I completed my federal return and two state returns. Yes, I owe money to all three. I wasn't quite ready to file them, however. I like to wait until Steve does his taxes so I can correct my mistakes. "Did you answer 'yes' to question #43?" He asked. "Yes," I answer, tentatively. "You shouldn't have." He says, then explaining the rationale. By the time I get back to my taxes a few days later, I have a list of things to correct. Foolproof, right? I am happy to report that as of this weekend, I have filed my federal return and one state. I will mail in my MA return this week. Maybe next year I will avoid this hassle and buy myself the luxury of a real accountant!